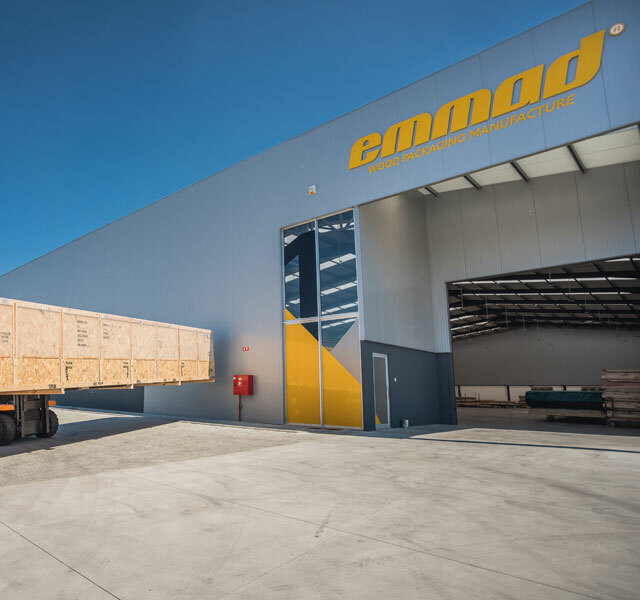 At Emmad, we design, develop and produce industrial wood packaging, while also extending our services to the protective packing of industrial equipment to be transported by air, road or sea. We have been creating solutions since 1978 and bringing together experience, innovation, technology and human capital so as to guarantee the most efficient equipment packing methods. We’re proud to have a highly qualified technical team, committed to creating tailored solutions for the utmost safety in protective packing and transport of goods. Our success comes with the success of our customers! We strive for that success and to achieve total customer satisfaction, we always invest in a win-win partnership based on respect and cooperation. For the companies that need to ship their products worldwide, the industrial packages grant a greater safety because they are designed and produced with strict quality criteria in mind, guaranteeing the safety and stability of the packaged product during its handling, transportation and storage until reaching the final destination, without compromising the delivery time. Emmad II – Embalagens Técnicas, Lda. For companies in the Aeronautics industry that need to ship their products, Emmad II combines the design experience with the production capacity for the development of technical packages tailored to each product. Always taking into account the delivery time of our customer, we work according to strict quality criteria in the production of the packaging, ensuring the safety and stability of the product packaged during its movement, transport and storage until reaching the final destination. In addition to our products, we have experienced teams in the realization of the packaging service, stowage and / or lashing of goods in container and flat rack from North to South of Continental Portugal, which allows our client to optimize time and resources for what really matters. 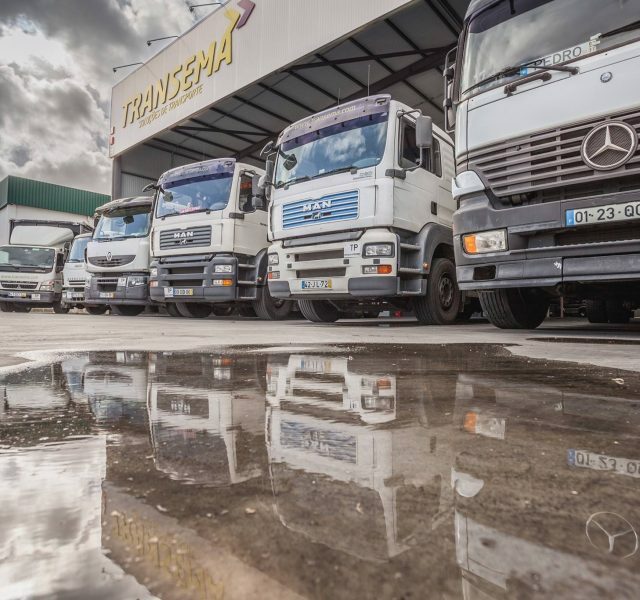 Transema is a young and dynamic transport company, oriented to the industrial sectors of molds and steels. There is a partnership with Emmad for the shipping of packages in national territory. It stands out for the speed and efficiency in the processes and counts on vehicles of various types – equipped with GPS and with capacity of 3500kg to 26000kg – that always maintains safety, either in the road or in the park. It has a crane with capacity up to 20 ton, forklift trucks with capacity up to 4 tons and a logistics area where we can carry out the packaging service, stowage and / or lashing of goods in container and flat rack. We intend to be the Iberian leaders in the production of technical wooden packaging and packing of industrial equipment, ensuring the highest quality standards through a qualified and motivated team. Our mission is to guarantee the maximum stability and safety of our customers’ products during transport by air, road or sea, not only through the design, development and production of wooden packaging, but also by providing packing and protective packaging services. We believe that our competitive advantage lies with our highly qualified and trained technical team’s ability to present the best packaging solutions and methods of packing equipment, thereby ensuring the safety of the goods during transport. 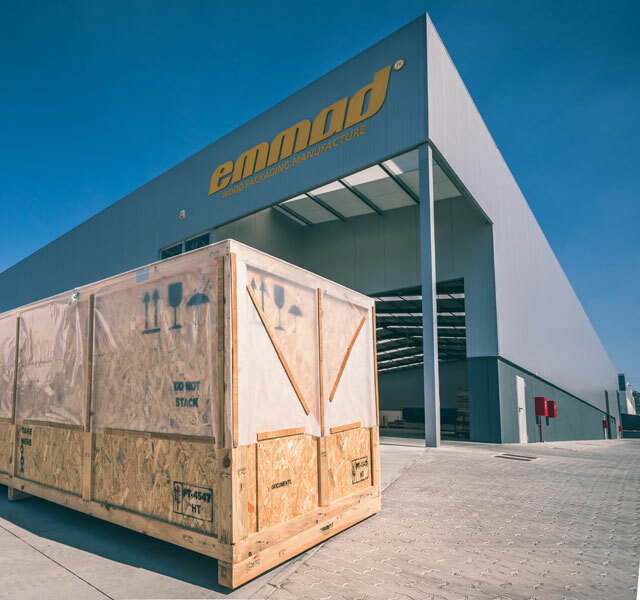 At Emmad, we produce quality packaging that meets strict conformity criteria, so that the packed equipment may be transported by any means and to any part of the world without being damaged. We are committed to constantly improve and achieve more! We want to be seen as the partners for our customers’ success and to be acknowledged as a Group that will do everything in its power to obtain their utmost satisfaction right from the design of the package up to the equipment packing operations. The word respect says a lot about the way we behave and interact with others. At Emmad, we do everything within our reach to meet our customers’ stipulated delivery times and we comply with the agreements established with suppliers, employees and other stakeholders.